It’s 8 a.m. Where did your breakfast come from? Sheridan student Shayne Asmundson had a Tim Hortons breakfast sandwich, which costs about $3.00 and could originate from far from the restaurant. Author Sarah Elton thinks a responsible meal choice would be buying local, sustainably grown produce. She will be speaking at the Oakville Public Library on Nov. 21.about buying sustainably grown foods. For more information, [modal id=”14589″ style=button color=default size=default]click here[/modal]. 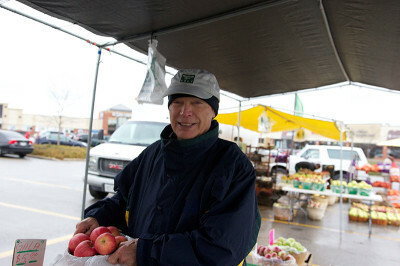 His family often shops at Organic Garage in Oakville and Food for Life in Mississauga and Oakville. 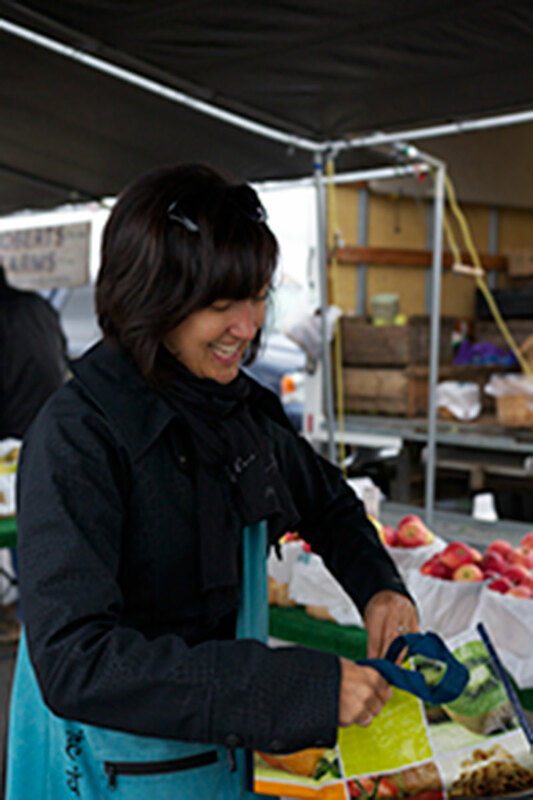 Many people think that by eating locally they are doing their part to help the environment. But this isn’t always true. Elton makes the distinction between buying local, and buying from sustainable food systems. The latter is more important, she said. “What I write about is the importance of sustainable food systems. Often sustainable will mean buying from your local sustainable farm,“ she said in a phone interview. 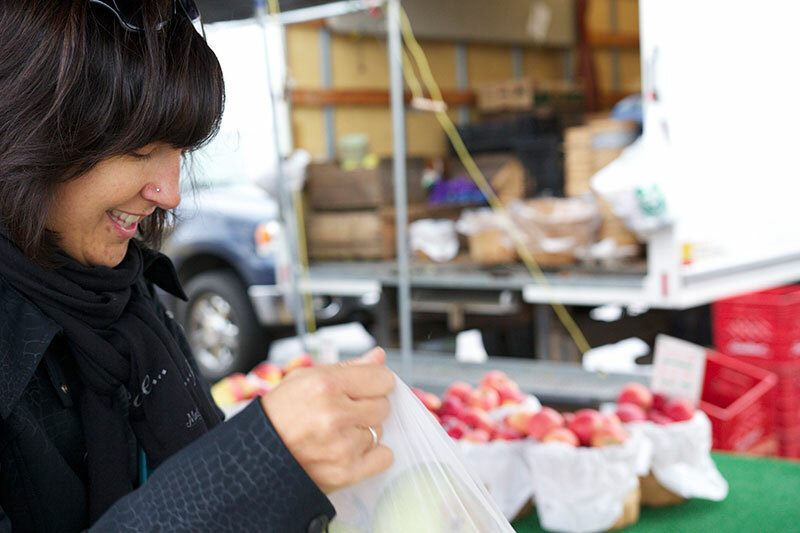 Buying from your local farmer isn’t necessarily buying sustainably, but it could be, she said. “It’s really important that you buy from a farm that is growing things in a sustainable way. It’s easier to figure out who that is in your community,” said Elton, whose most recent book is Consumed: Food for a Finite Planet. There are organizations to help you make an informed decision, she said, including Community Supported Agriculture (CSA) and Young Agrarians, an organization representing young people who want to be farmers across Canada. So I would connect with these groups if you want to make an informed decision about whether the farms you buy from are sustainable, she said. But people in their 20s have a lot of costs to juggle, and eating sustainable foods may not be their top priority. So if you’re a student with money concerns, there are organizations working to make this kind of food more accessible to everybody. Doug Guthrie, manager of the Oakville Civitan Club’s farmers’ market, holds up a bag of apples for sale at the Roberts Farm’s booth on Saturday. Guthrie has been managing the market since 1999. Ann Brown from the Plant Lady has been selling produce at the Oakville Civitan Club’s farmers’ market for 12 years. 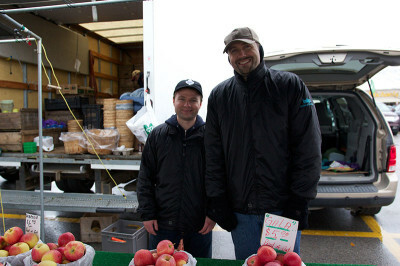 Ted Szarko, left, and Rick Szarko man their booth for the Roberts Farm at the oakville Civitan Club’s farmers’ market at Dorval Drive and North Service Road. 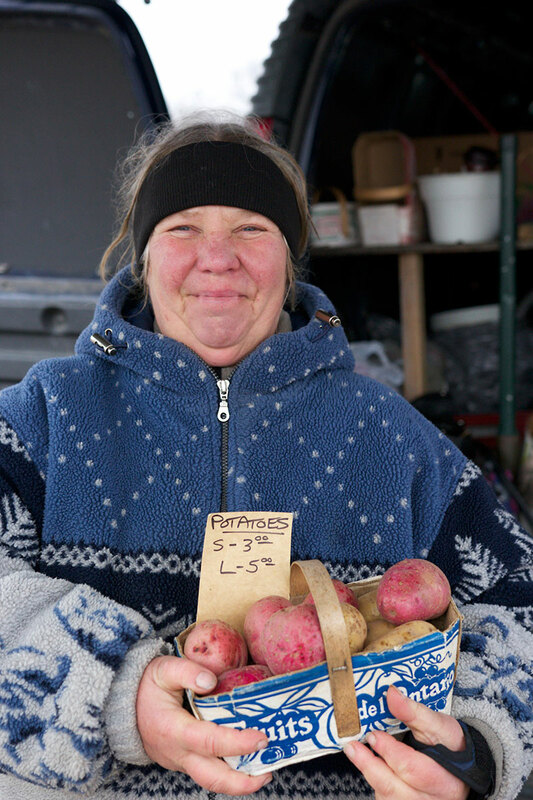 The Roberts Farm has been vending at the farmer’s market (which recently moved locations) for about 25 years. Lisa Landsmann seems happy with her fresh apples from the Roberts Farm. Lisa Landsmann buys some fresh vegetables from Don Moir of the Roberts Farm stand in Binbbrook at the Oakville Civitan Club’s farmers’ market. “I think it’s cheaper to come to the farmers’ market. I find that I spend more carefully, I make more specific choices about what I’m getting, and because you’re buying stuff that’s in season, it’s cheaper. The No. 1 reason people want to shop locally is to help the local economy, said Bert Andrews, owner of Andrews’ Scenic Acres in Milton. But buying from a local supplier doesn’t necessarily mean a product is from Ontario originally. “We buy locally as much as we can. But there’s not very many seed suppliers in the world, quite frankly,” he said. He purchases his seeds from someone in Ontario but, “I have no idea where it comes from. You’re not told, so you never know,” Andrews said. Restaurants with a reputation for serving local food can unintentionally lead you to think the produce comes from local farms. Andrews started Andrews’ Scenic Acres in Milton in 1980 with his wife Lauraine. Their emphasis from the beginning was to serve the local community. 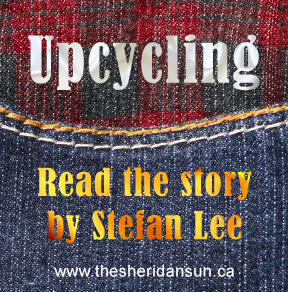 As soon as the strawberries, raspberries and blueberries they planted that year were ripe, “we did ‘pick your own’ and you can’t get any more local and fresh than that,” he said in a phone interview. He thinks price may be a factor in people’s decision to buy local fresh produce. “We’re all price-conscious and shopping locally may actually be more expensive,” Andrews said. People might expect it to be cheaper “because they figure it doesn’t have to come all the way from California or whatever,” Andrews said. “We use local suppliers but it’s not necessarily local produce. They bring stuff in from all over,” Blake Stoneburgh, co-owner of Stoney’s Bread Company in Oakville, said. Organic Garage buys produce from the Ontario Food Terminal as well as local organic suppliers when possible. “We definitely purchase local produce when it is available, however we do support organic produce from around the world simply because we want to support organic farming practices no matter where it is,” Matt Lurie, president of Organic Garage in Oakville, said in an email. Elton doesn’t think price has to be a factor in your decision to buy local, sustainably-grown foods. “Yes, sustainably-raised dairy products and meat products are definitely more expensive. But if you buy your veggies and your fruit in season and you’re choosey, I find that the prices often match at Loblaws what they are at the farmers’ market,” she said. Added by Taylor Shappert on November 5, 2013.